Students at Hood River Middle School don’t just read about science; they touch and experience it every day. Projects such as working with an electrician to install a solar panel, connecting pipes for a water filtration system, and growing, cooking and selling produce provide opportunities for exploring and applying science, math, writing and social issues. All of these activities take place in the campus’ new Music and Science Building, which opened in 2010 and is operat­ing on a net zero energy basis. The building also is providing insight into how occupant behavior impacts building energy use. The Music and Science Building demonstrates that net zero can be affordable under con­ventional budgets. Government and utility incentives help reduce the LEED Platinum project’s costs for a 20-year or less payback. Also, the building was part of the nonprofit / industry supported Energy Trust of Oregon Path to Net-Zero Pilot Project that aims to refine design strategies to achieve net zero onsite building energy use. 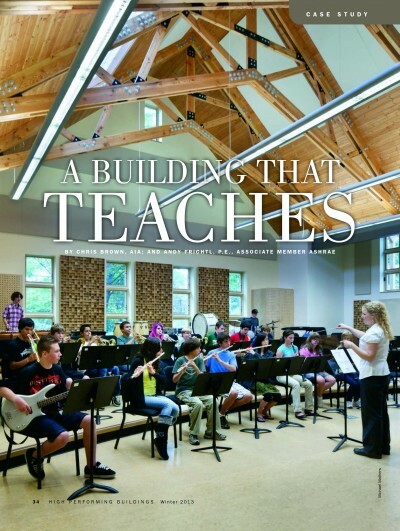 Because the Music and Science Building is situated adjacent to the historic main school building, the designers had two primary objec­tives: to create a public building that fuses sustainable design with the sustainability curriculum and to carefully integrate the facility into the existing National Historic Landmark site. The design uses gabled roof forms, brick and precast details to reflect the original school building constructed in 1927. A 2008 construction bond, which funded the project, aimed to accom­modate an increasing school popula­tion that had forced the music pro­gram into an old bus barn outbuilding and to replace the existing outdated science labs with facilities that reflect changes in science teaching technol­ogy. The new freestanding building houses a state-of-the-art music facil­ity, a fully integrated science lab, and greenhouse for teaching environmen­tal science programs.